Enjoy this deliciousness right here! Cook onion and butter on medium-low heat until softened and translucent. Stir in flour, garlic powder and pepper. Cook an additional 2 minutes. Gradually pour in milk while whisking. Continue whisking over medium heat until thick and bubbly. Remove from heat and add dry mustard, paprika, cream cheese and 1½ cups cheddar cheese. Stir until melted. Place broccoli in boiling water for about 2 minutes. You still want it slightly crisp as it cooks more in the oven. 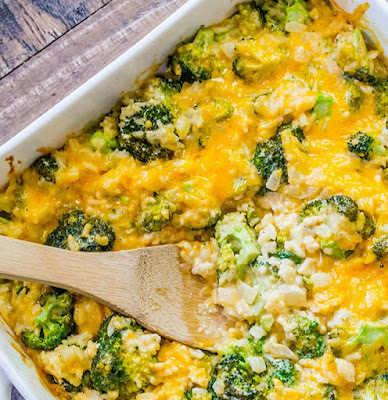 Stir together rice, broccoli and cheese sauce. Place in a greased 2 qt casserole dish. Top with remaining cheese and bake 35 minutes or until bubbly and cheese lightly browned.